Kanger has become legendary for its devices, and it continues to offer the latest technology in a box mod and tube mod format. The newest addition to the Kanger line of products is the all new Kanger SubVod Mega TC Starter Kit. 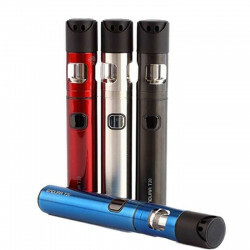 The SubVod offers a tube shape and consists of the Kanger SubVod Mega 2300mAh Battery and the Kanger TopTank Mini. This pairing delivers a top of the line performance with its 2300mAh battery capacity, temperature control ability and must-have TopTank Mini that features a top fill design, a 4mL e-liquid capacity and adjustable airflow control. Kanger simply continues to make good vaping experiences even better! WARNING: This is an advanced Item. Please use at your own risk and always use proper precautions and handling. Do not use a short or flat 510 connection on any hybrid or hybrid style device in conjunction with this item. If unsure whether this pertains to your particular set-up, you may contact Direct Vapor Customer Service. DO NOT assemble or use until you are certain. Love love love this vapor!! Owned several very expensive ones and this vapor has never EVER failed to work for me ! My oldest subvod 2300 is 5years old and still vaping strong my favorite!! I own two my last one is about 4 years old bought it to have a extra one! Now I am ordering yet another one just for special occasions lol and I need a new color! Anyway you cannot go wrong with this vapor!! I bought this as a more travel worthy size mod. Compared to my RX200. To that end it fits the bill. The TC mode produces a good cloud and a nice clean flavor. The wattage mode seems to be mostly reliable. With a dry hit here and there. I tried the ni200, .2, the .5 and the .5 Clapton. So far the NI200 was the best. It doesn’t fire the Clapton’s well and it struggles with the .2 also. The .5 was pretty good. All in all a great mod for a starter and a fun toy for an experienced vape. I ordered this hoping to cut back on smoking (after smoking 1 1/2 packs a day for over 20 years). Not only did I cut back, I've been cigarette free since day two of owning this! Very easy to use for a newbie like myself and seems to be well constructed. I even ordered a second one to keep as a back up while charging the other. Both have worked splendidly. Not sure if I mentioned that I haven't had (or even wanted!) a cigarette in 16 days but, I haven't. Very fast shipping....I couldn't be happier. Thinking about quitting cigarettes but get that queasy feeling of "quitting is too hard"? Worry no longer... make the switch, give yourself a couple days to get used to it, and take a deep breath (because you'll actually be able to breathe again). I honestly never thought it would be that easy. Overall, very easy to use device, great service and fast shipping. Amazing product I am a pack a day smoker and I received this vape this morning and have only had 1 ciggerette so far and that was during the first battery charge ice has no cravings so far. Make sure to use the blue ringed coil for temp. control mode and red ringed coil for power mode the instructions wernt clear on that. Highly recommend this product for people looking to quit smoking ciggerette. Its been a year now and being smoke free for that long has really changed my life. Im 46 and smoked analogs since i was 13 and habitually smoking since i was 15 (able to buy my own and not sneak and steal smokes from family members). No more ashtrays, stinky clothes, stained house, fingers and truck and most importantly i can breathe. Started with V2 pro series 3 pen and purchased a Toptank Mini few months later. Couple months after that i bought a Subvod Mega TC (smtc) for convenience. I gotta say the Toptank is great. Easy to use, clean and coils last a couple weeks (1 week in i would clean & dry while using another). The TC function is okay. I have two smtc & one does a better job than the other with the Ni200 SSOCC. I found the SSOCC 0.5 & 1.2 ohm NC coils work really well. The real prize with the smtc IS the Toptank and the best SSOCC is the Clapton. Clapton SSOCC can be used with the unit but theres a bit of ramp up thats a little annoying and the vapes a bit cool. Using the Toptank with a mod the SSOCC NC coils are good but the Clapton really does a great job with flavor. The battery will last a couple tanks and the unit feels good in hand. About three hours fully charges the battery. The unit is easy to operate five clicks on/off and three clicks to change modes. Red ring for Wattage and Green for TC. The smtc i purchased from Direct Vapor did die for some reason. After five or six weeks the battery just wouldnt work; tank was fine. Direct Vapor did exactly as promised and emailed me a return label and shortly after sending the unit back I received a replacement. 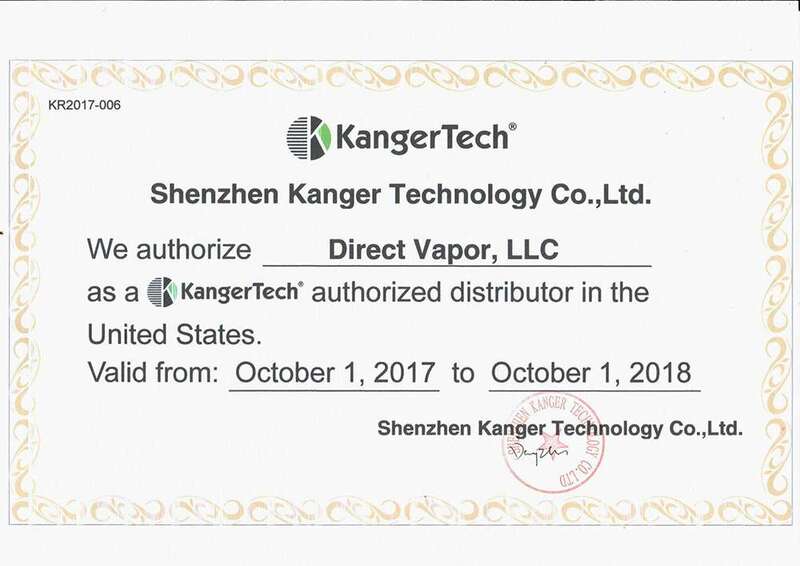 You may find the smtc cheaper elsewhere but Direct Vapor is an authorized Kangertech distributor and theres no problem if you have a problem. This vape was my first ever, and I really loved it. Everyone said Kanger Tech was a good brand to get (its pretty much the best) and so I went looking for a cheap but reliable Kanger vape. This was the perfect choice. This vape has great clouds especially with the adjustable airflow, a large enough tank to get anyone through the day, and the temperature control feature works perfectly (although I kinda like it off). The only problem I would say is that the battery doesn't last the longest but what can you expect from a vape pen, and the great thing about rechargeable batteries is when they die you can recharge them. This one has a simple micro usb so you can charge it in your car (like me) or virtually anywhere. It also looks awesome (I got stainless steel) and it feels like quality, the same feel you get when you touch a brand new Iphone 6 or something like that. I dropped it once, on hard tile floors and the glass tank didn't even get a scratch so its also built sturdy. I used it for about a year, and it still looked practically new. Eventually I gave it to my friend as a gift so I could upgrade to a box mod, and that was Kanger too. Overall its a great product and for 35$ or even 50$ its hard to find anything better. Just bought this today and so far so good. I did notice it goes through a lot of liquid but I'm getting good big clouds. I will review again after seeing what the battery life is like. That's my only concern so far. I bought the black one btw and aesthetically it is very impressive. First time consumer here. I heard of all the good qualities that Kangertech products had and decided to get the Mega TC. I also purchased a lot of coils that is the best for the temperature control. I love my eCig! I make huge clouds and since I purchased it, I cannot stand a real cigarette! The taste is absolutely nasty! No ash everywhere, no need of a cigarette lighter (I used to look for one all the time! ), no broken voice in the morning and during the day, no dry mouth and throat, no flegm at all, I mean, I see all the good benefits and I have had my eCig for less than 3 weeks now! It is awesome! The battery last 3 full days and I refill the tank after each recharge! And I vape quite a lot! The only problem I had is to find the right glass tube that broke on me. I purchased 2 replacement ones but they were too long and couldn't return them because the 15 days return policy was expired. No big deal, I just kept them and I did the right thing! I visited a store close to my home because I missed my eCig too badly and I found a new tank that fit my Mega TC and the 2 glass tubes I had purchased are made for it. I could have purchased this new tank from the company and I would have paid much less for it but I needed one right away. Anyway, I am happily back to my eCig! I know that later, I will purchase from DirectVapor still another eCig but I just will make sure that all parts are available prior to ordering! Anyway, thank you DirectVapor for offering us excellent products at a very good price. And also, the customer service service is very good too! You rock! It's been a great kit so far and very simple for someone new to vaping (retired regular smoker for over 10 years). Comes with everything you need to get going except the juice. I love the top fill feature as much as the built in battery. I know a lot of people like using boxes that require a battery but a built in battery makes the first purchase less intimidating. I get plenty of airflow wide open, the battery lasts for days on end (medium usage for me), and a full tank goes for days as well. The only slight concern is using the black color when it's hot outside with the sun which makes the mod and tank heat up a lot. Other than that, great purchase!! I had the original subvod and it was my OTG failsafe vape. I bought the Mega for a few reasons and so far it has accomplished almost all of them. The original subvod was so small it kept falling over left right and center both on tables etc and in my pockets. Also, the full adjustable airflow on the subtank mini, led its self to collecting a whole bunch of juice around its edges and occasional leaking. The use of the top tank mini on the mega has fixed the leaking issue (so far) and the bigger battery with side charge port has alleviated alot of the issues in terms of balance with the mod. Only thing I was worried about with this was a temp control mod with no screen. I assumed there would be some button sequence to edit the temp control function, but its a real set it and forget it kind of deal which leads me to question why its even included. Overall great product and a basic evolution of the original.